The quarry was first discovered in 1890 by Felix von Luschan, director of the Zincirli, ancient Sam'al excavations. It was systematically surveyed and excavated between 1958 and 1961 by Prof. Bahadır Alkim. During this period hundreds of roughed-out statues were found. Technical studies, a typological classification and scale drawings were published. The importance of site lies not only in its rich quarry but also in that it is the largest known open-air sculpture workshop in the ancient Near East. * It shows methods of quarrying and shaping basalt blocks. * It provides examples of every stage in the production of rough-outs of sphinxes, lions, reliefs, statues in the round, etc. * It provides stone rough-outs of motifs, including lions, the sphinx, mountain gods and man-bear, from the sculptural repertoire of the Hittite Imperial Period (c. 1460-1180 B.C.). This shows the cross cultural exchange of symbols that are present in sculptural art. * It shows the development from the 15th century B.C. down to the 8th century B.C., apart from an interruption during the invasions of the Sea Peoples into the region. It seems that the craftsmen were of Hurrian origin during the period of the Hittite Empire (15th-12th centuries B.C. 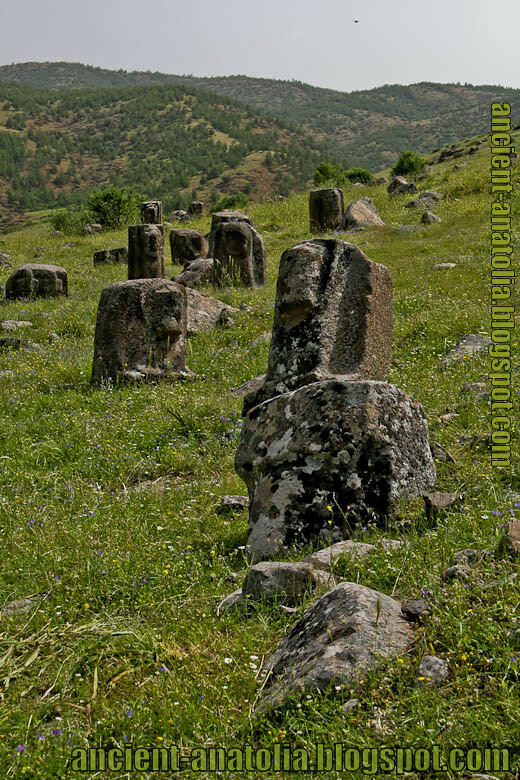 ), whereas they were probably of Aramean origin in the Neo-Hittite period (10th-8th centuries B.C.) when the region lay within the Kingdom of Sam'al. None of the tools used in the roughing-out the sculptures have been found. Investigations made on samples from various stages to the roughed-out sculptures reveal that tools included stone hammers and chisels, polishing stones and levers. Evidence for the use of the saw and drill has not been recovered in Yesemek. The fine porosity and regular cleavage of the stone might have made saws unnecessary. Nevertheless, basalt orthostats with drilled holes at Tilmen Höyük, to the 10 km. north of the workshop, in levels dated to the 18th and 17th centuries B.C. suggest that the drill was known to the stone masons at Yesemek. 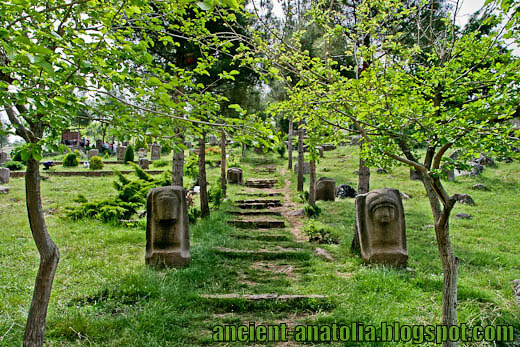 Architectural sculptures commissioned from Yesemek were dispached to their final destination unfinished, and thus did not have holes drilled into them. Trial excavations at Yesemek Mound, one kilometer west of the sculpture workshop uncovered occupation of the 2nd and early 1st millenia B.C. Part of a settlement with many ceramics and structural remains, probably belonging to the Yesemek workmen, their overseers and others, was revealed. The Yesemek quarry sculpture workshop was finally abandoned in the last quarter of the 8th century B.C. Most of the roughed-out statues at the Yesemek workshop are lions to flank monumental gateways. Surveys, trial trenches and excavations have so far revealed rough-outs of 95 of them. The thirty roughed-out protomes of sphinxes found in Yesemek sculpture workshop on narrow blocks. Sphinxes stood in building entrances or gate ways and had a protective function. The sphinx originated in Egypt, where it was generally a masculine creature with a lion's body and a human head. 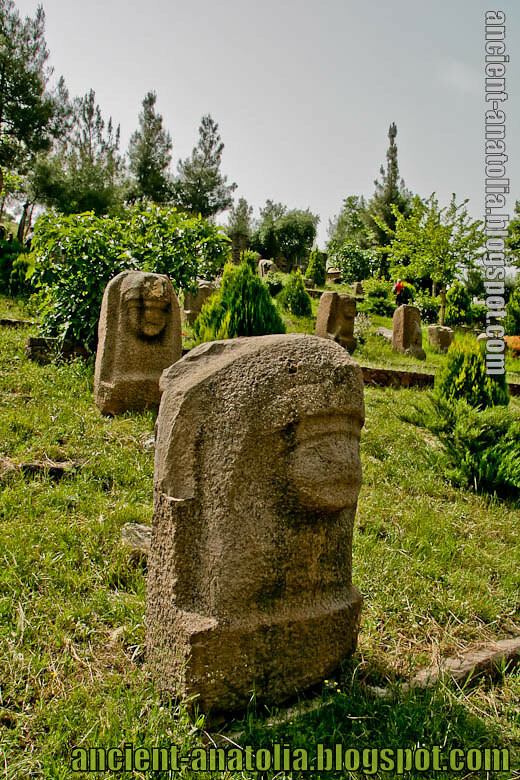 Hittite sphinxes of the second millenium B.C. however, were usually feminine, with theit hair falling over the breast curling outward at the ends. Sphinxes with curling hair are of the "Hathor" type, deriving probably from Palestine or Syria. The Yesemek sculpture workshop must have played an important role in the transmission of the sphinx to the Hittites. There roughed-out reliefs are sculpted in a style resembling that of the Hittite Imperial Period, second half of of the secend millenium B.C., and thus appear to have been made at about the same time. The posture and clothing of the gods is much the same on all the reliefs. The figures are depicted in the frontal position with arms crossed over the chest. They have no feet, and their skirts appear to spring directly from the earth in the form of a mountain. They have bearded faces and wear cylindrical hats. In some of the reliefs, the solar disc motif can be seen. The coposite creature with a bear's head and a man's body appears to be a figural type unique to the Yesemek sculpture workshop, not found else where in the sculpture of the ancient Near East. This creature, or possibly a priest with a bear mask, may have played a role in local cult practice. Hartagga, a bear-man figure known from the Hittite cuneiform tablets of the XIV-XIII centuries B.C., has been identified as a temple official. The roughed-out bear-man creature from Yesemek can be dated back to the second half of the second millenium B.C. This relief was made of three blocks, only two of which have been found. The relief can be dated back to the eighth or ninth century B.C. Only one rouhed-out staue in the round has been found in the Yesemek sculpture workshop. Similar statues in the round have been found at Zincirli, Gercin and Karatepe, dating back to the 8th and 9th centuries B.C. Two architectural fragments have been found in Yesemek: a plain and sculpted column base. On the sculpted column base are depicted two antithetic animals or composite creatures flanking a sacred tree.